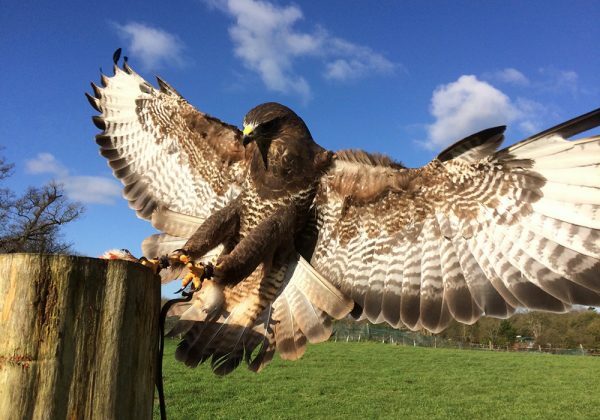 The most popular question asked at any falconry event is why do the birds come back? This is a free animal, in most cases one that is very capable of hunting and surviving for itself. So why return? The answer is the bond, the trust the bird has that you will not hurt it. It makes a choice to land on a fist, it is never a given conclusion that it will do so, it has free will. This choice is a moment of magic, a snap shot of bonding and trust between man and bird. 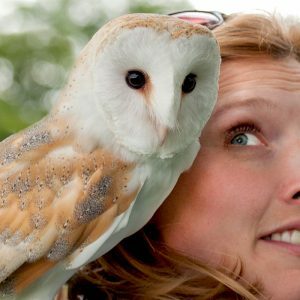 Feathers and Furs’ Half Day Bird of Prey Sessions offer these moments, a wonderful chance to have a really close encounter with some of Britains’ stunning Birds of Prey and a few of our neighbouring countries ones too, creating memories never to be forgotten. Our Gift Vouchers are a wonderful option and we have tried to cater for everyone. In the drop down above you have the option for 2 adults, 1 adult with Spectator or 1 adult. New for 2017 is 20% off for weekday only options for those that can come Tuesday to Friday. Our meeting point is Ladd’s Garden Village, Reading, Berkshire. 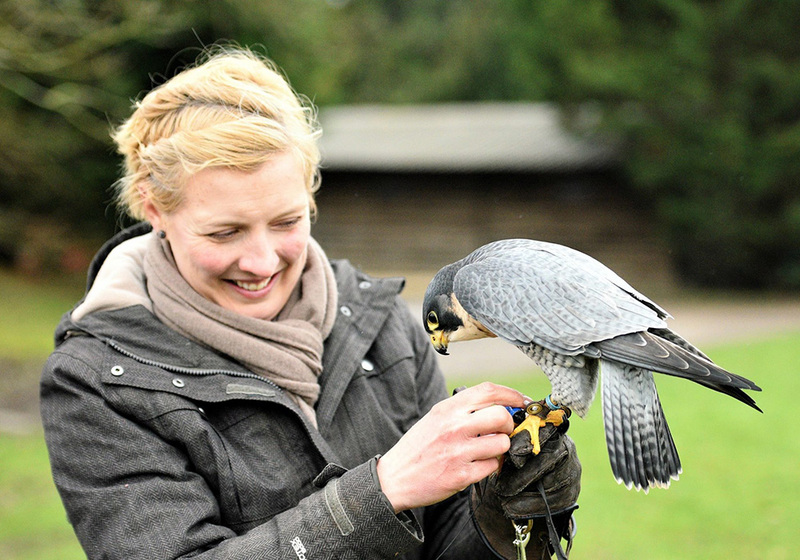 Feathers and Fur has a purpose built centre within Ladd’s Garden Village where the birds are on show to the public. 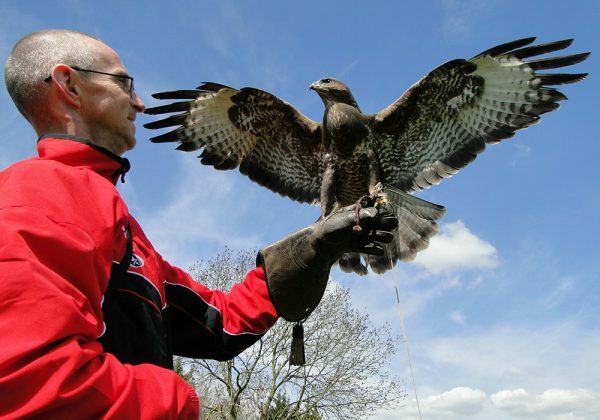 Here you meet the falconers and after human introductions you are introduced to all our birds. 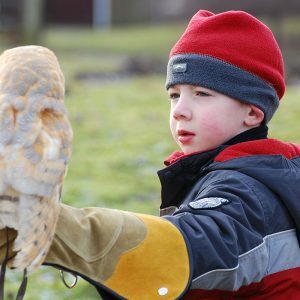 We then have a quick safety talk and you are shown how to call and hold the birds correctly and are given a falconry glove to use for the duration of the session. The half day session is a really hands on experience and over the 3 hours you will be introduced to, handle and fly a wide variety of raptors, including the Barn Owl, European Eagle Owl, Tawny Owl, Peregrine Falcon, Kestrel, Buzzard, and Harris Hawk. Feathers and Fur is also lucky enough to be surrounded by wild Birds of Prey including the magnificent Red Kite. Once a very rare sight in our skies now the broad winged silhouette is a wonderful addition to the beauty of the British countryside and one that we are pleased to see souring high over us on a daily basis. Throughout the whole session you are welcome to take photographs and ask questions. A session includes tea and coffee. 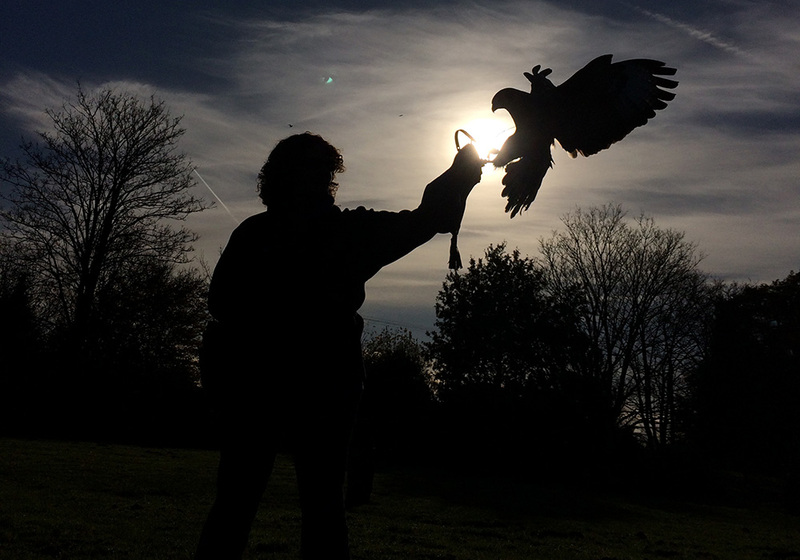 The Half Day Bird of Prey sessions are held mornings only in the winter period and mornings and afternoon in the summer. Sessions are limited to 6 participants ages 16 and over. This experience can be purchased as a voucher and is valid for 1 year. An additional spectator can be added on the day for £15 per person, but this is limited to 1 per voucher and not for those vouchers purchased with a spectator already attending. If you are interested in a private larger or family group please feel free to contact our team and we can discuss options. Booking your session date couldn’t be easier, simply visit the following link to view the available dates and fill in the form beneath the calender. www.feathersandfur.co.uk/halfdaybooking.html . **Please note you MUST have paid for and received a voucher number in order to confirm your date, you will need the voucher number for fill in the form **. Weekend and school holidays fill up months in advance so please don’t leave it until the last minute! Please do not hesitate to email or call our information team if you require any help with booking a session or would like to purchase a voucher. I wanted to write and thank you for the wonderful experience I enjoyed your hands-on session yesterday with Bert, Ash, Billie-Jean, Mouse, Echo and Acer. The birds are very impressive and so beautiful, even if they are moulting or recovering from attack! I couldn’t pick a favourite but undoubtedly the star of the show is you; your enthusiasm and passion for your birds shone through. I can’t guess how many times you must have imparted the same information to endless streams of visitors but it didn’t show at all, your delivery was fresh and interesting and engaging. 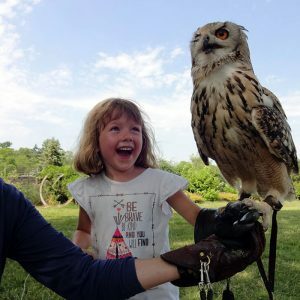 I also learned a lot from you about habitat, diet, conservation and enjoyed getting much more from the day than just having the birds on my hand. I already knew that keeping just one bird would be a big commitment (through research, not experience) so this is very clearly a labour of love for you and I recognize the dedication you give to them all. Please keep doing what you do, I think it’s brilliant and you clearly have a gift for engaging with people as well as birds! Just thanking you for an awesome experience yesterday. Ella and I were fascinated. You are so knowledgeable and funny! It really made the day memorable. It’s also reassuring that there are everyday folk like you out there so passionate about conservation and those beautiful birds. I will recommend the ‘intimate’ experience to others. I just wanted to say a massive thank you for today. I’m so glad we brazened out the weather! I’m still buzzing, I was delighted by getting so hands-on with your amazing birds, and I learnt so much, I think you are a great storyteller and your obvious passion for what you do, and how you have built up the centre, is very inspiring. I made some great memories today, and having gone through all the photos there are some great shots, so thanks again for taking them.